The bloodiest single-day battle in American history occurred approximately 15 miles from my house. Nearly 23,000 soldiers died, were wounded or went missing after twelve hours of combat on September 17, 1862 at the Battle of Antietam during the Civil War. The lingering echoes and impact of that battle are still felt more than 150 years later. Both the Union and the Confederacy experienced devastating losses, and historians have never declared a true winner. But for me, my family won. My great, great-grandfather James F. Bartlett (his biography and obituary are on this website right below Edward Bartlett’s) fought with the Massachusetts Infantry and survived. although he did sustain injuries on May 6, 1864, at the Battle of the Wilderness. 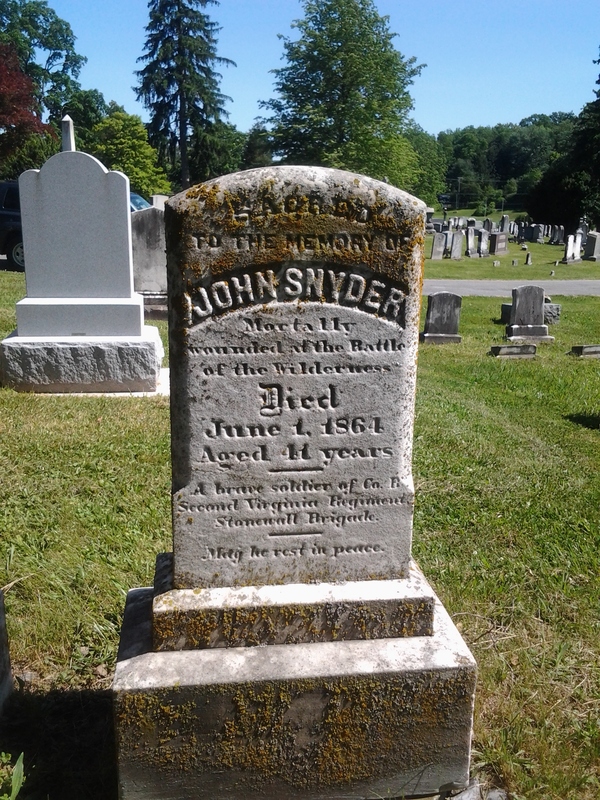 Ironically, my husband’s great, great-grandfather, John Snyder, died in June 1864 of wounds he sustained at the Battle of the Wilderness while fighting with the Stonewall Brigade. Years ago, a local historian gave my husband and me a tour of John Snyder’s town and legacy. The tour ended at Elmwood Cemetery in Shepherdstown, where he is buried. Newly married, I was actually interested in John Snyder until our volunteer tour guide pulled out a Confederate flag for my husband to place on his great, great-grandfather’s grave. I loudly proclaimed that the Confederate flag had a very specific meaning, and my husband was not allowed to touch it. He tried to explain the flag was meant to honor his great, great grandfather, but I declared that the Confederate flag had nothing to do with honoring anyone. My husband placed the flag on the grave anyway. Years later, I recognize my words were nothing but rude, and I had absolutely no right to be indignant. I’ve never put my life on the line for my beliefs, and I have no right to judge those who did. All I can be is thankful. The passage of time can change perspective and opinion about what is best and sometimes even what is moral, but it will never change what is honorable. My children carry the blood of two honorable men who fought for what they believed during a time when our nation was completely divided. They also carry the last name of a man who lost his life fighting for what he thought would be a better life for them. On Memorial Day, I have no right to argue about putting a Confederate flag on a soldier’s grave. Instead, I should simply be grateful that I have the freedom to make those arguments. That freedom didn’t come without a price, and today we honor those who paid it. Posted on May 27, 2013, in Family, history, My life, perspective and tagged ancestry, Family, history, Memorial Day, perspective, Thoughts. Bookmark the permalink. 4 Comments. Right down the road from us in Clover, SC, confederate flags were put on the graves of the soldiers at the Presbyterian ARP church. Someone removed the flags and set them behind the church. I love Brad Paisley’s new song. Feelings and opinions of the Confederate flag are so incredibly complicated… and living in an area that straddles the north and the south, it’s enhanced. I’m sure Brad Paisley gets that since he’s from WV. I live near to Lexington, VA, where Robert E. Lee and Thomas Jonathon Jackson (Stonewall) are still heroes. There is a continuing controversy here (and even a lawsuit) about whether the Confederate flag can be flown on a bridge entrance to the town on one special day a year celebrating “Lee-Jackson Day.” So, your post is more than interesting. The Civil War is still a current event in some states of the Union. Thanks for this post. It sheds some light on common sense. Oh yes, Lexington… Stonewall Jackson territory. My husband has required stops there to visit the sites.There is very fine line we walk between honoring the man and honoring the cause, isn’t it? People who don’t live in Civil War country certainly haven’t experienced the ongoing drama.